Schwab reports total assets of $2.57 trillion $1.27 trillion of which is advised assets; TD has total assets of $710 billion. Charles Schwab (SCHW) and T.D. Ameritrade (AMTD) reported this week that their total assets as of May 31 grew 9% and 12%, respectively, from a year ago. 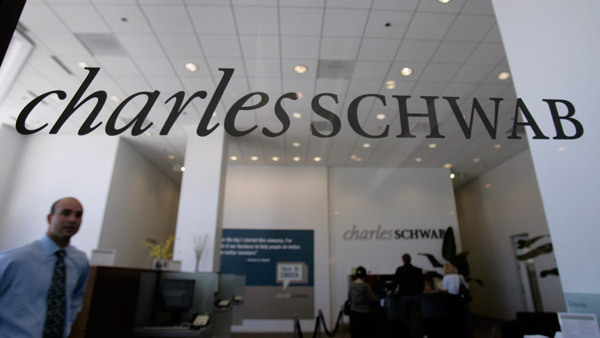 Schwab said Friday that its client assets totaled $2.57 trillion at the end of May, representing a 9% year-over-year jump and a 1% increase from April. Net new assets were $10.1 billion in May, up 11% from $9.1 billion in April but down 7% from $10.9 billion a year ago. Assets at Schwab owned by clients who receive ongoing advisory services were $1.27 trillion, up 10% from May 2014 and 1% compared with April 2015. This 10% year-over-year growth pace was ahead of two major stock indexes. From June 1, 2014, to May 30, 2015, the Dow Jones rose about nearly 8%, while the S&P 500 ticked up at about 9.5%; during this period, the Nasdaq jumped 19%. For its part, TD Ameritrade says its total assets increased 12% year over year and 1% month over month to $710.8 billion as of May 31. The average fee-based balance at TD in May was $161.8 billion, up 17% from May 2014 and up 1% from April 2015. Clients made an average of 427,000 trades per day in May 2015, up 11% from a year earlier but down 7% from the prior month. Last month, Schwab topped the J.D. Power rankings of self-directed investors. “In announcing their latest rankings, J.D. Power emphasized that being a self-directed investor doesn’t mean going it alone, and that self-directed investors really do want a relationship with their firm that includes access to do-it-yourself tools and resources as well as help and guidance and superior service when you need it. That couldn’t be truer at Schwab,” said President and CEO Walt Bettinger, in a statement. — Check out Best Firms for Self-Directed Investors: J.D. Power—2015 on ThinkAdvisor.